A Gala Dress was retrieved from A New England Nun and Other Stories (1920). Emily eyed her sister. She tried not to look pleased. “I know you went to meetin' last,” said she, hesitatingly; “but — a Fourth of July picnic is — a little more of — a rarity.” She fairly jumped, her sister confronted her with such sudden vigor. “Don't you s'pose I could get along without a cake?” Emily ventured, tremulously. “Well,” said Emily, with a long sigh of remorseful satisfaction. She arose, showing a height that would have approached the majestic had it not been so wavering. The sisters were about the same height, but Elizabeth usually impressed people as being the taller. She carried herself with so much decision that she seemed to keep every inch of her stature firm and taut, old woman although she was. Emily oscillated wearily over her sister and the dress. “I ain't very strong in my back, an' you know I've got a weakness in my stomach that henders me from standin' up as straight as you do,” she rejoined, rallying herself for a feeble defence. Elizabeth passed over the dress, handling it gingerly. “Mind you don't cut it rippin' of it off,” said she. Emily sat down, and the dress lay in shiny black billows over her lap. The dress was black silk, and had been in its day very soft and heavy; even now there was considerable wear left in it. The waist and over-skirt were trimmed with black velvet ribbon. Emily ripped off the velvet; then she sewed on some old-fashioned, straight-edged black lace full of little embroidered sprigs. The sisters sat in their parlor at the right of the front door. The room was very warm, for there were two west windows, and a hot afternoon sun was beating upon them. Out in front of the house was a piazza, with a cool uneven brick floor, and a thick lilac growth across the western end. The sisters might have sat there and been comfortable, but they would not. “Set right out in the face an' eyes of all the neighbors!” they would have exclaimed with dismay had the idea been suggested. There was about these old women and all their belongings a certain gentle and deprecatory reticence. One felt it immediately upon entering their house, or indeed upon coming in sight of it. There were never any heads at the windows; the blinds were usually closed. Once in a while a passer-by might see an old woman, well shielded by shawl and scooping sun-bonnet, start up like a timid spirit in the yard, and softly disappear through a crack in the front door. Out in the front yard Emily had a little bed of flowers — of balsams and nasturtiums and portulacas; she tended them with furtive glances toward the road. Elizabeth came out in the early morning to sweep the brick floor of the piazza, and the front door was left ajar for a hurried flitting should any one appear. This excessive shyness and secrecy had almost the aspect of guilt, but no more guileless and upright persons could have been imagined than these two old women. They had over their parlor windows full, softly-falling, old muslin curtains, and they looped them back to leave bare the smallest possible space of glass. The parlor chairs retreated close to the walls, the polish of the parlor table lit up a dim corner. There were very few ornaments in sight; the walls were full of closets and little cupboards, and in them all superfluities were tucked away to protect them from dust and prying eyes. Never a door in the house stood open, every bureau drawer was squarely shut. A whole family of skeletons might have been well hidden in these guarded recesses; but skeletons there were none, except, perhaps, a little innocent bone or two of old-womanly pride and sensitiveness. The Babcock sisters guarded nothing more jealously than the privacy of their meals. The neighbors considered that there was a decided reason for this. “The Babcock girls have so little to eat that they're ashamed to let folks see it,” people said. It was certain that the old women regarded intrusion at their meals as an insult, but it was doubtful if they would not have done so had their table been set out with all the luxuries of the season instead of scanty bread and butter and no sauce. No sauce for tea was regarded as very poor living by the village women. To-night the Babcocks had tea very soon after the lace was sewed on the dress. They always had tea early. They were in the midst of it when the front-door opened, and a voice was heard calling out in the hall. The sisters cast a dismayed and indignant look at each other; they both arose; but the door flew open, and their little square tea-table, with its green-and-white china pot of weak tea, its plate of bread and little glass dish of butter, its two china cups, and thin silver teaspoons, was displayed to view. “My!” cried the visitor, with a little backward shuffle. “I do hope you'll scuse me! I didn't know you was eatin' supper. I wouldn't ha' come in for the world if I'd known. I'll go right out; it wa'n't anything pertickler, anyhow.” All the time her sharp and comprehensive gaze was on the tea-table. She counted the slices of bread, she measured the butter, as she talked. The sisters stepped forward with dignity. “Come into the other room,” said Elizabeth; and the visitor, still protesting, with her backward eyes upon the tea-table, gave way before her. But her eyes lighted upon something in the parlor more eagerly than they had upon that frugal and exclusive table. The sisters glanced at each other in dismay. The black silk dress lay over a chair. The caller, who was their neighbor Matilda Jennings, edged toward it as she talked. “I thought I'd jest run over an' see if you wa'n't goin' to the picnic to-morrow,” she was saying. Then she clutched the dress and diverged. “Oh, you've been fixin' your dress!” she said to Emily, with innocent insinuation. 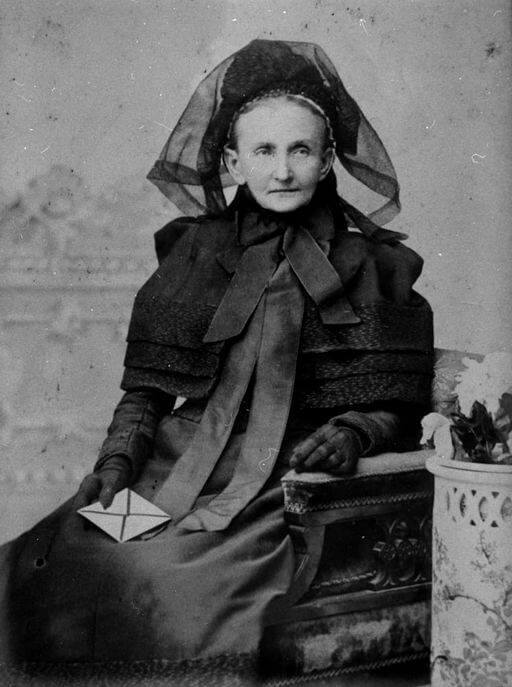 Insinuation did not sit well upon Matilda Jennings, none of her bodily lines were adapted to it, and the pretence was quite evident. She was short and stout, with a hard, sallow rotundity of cheek, her small black eyes were bright-pointed under fleshy brows. “Yes, I have,” replied Emily, with a scared glance at Elizabeth. Elizabeth surveyed her calmly. “Yes; I've always worn black velvet on it,” said she. Emily sighed faintly. She had feared that Elizabeth could not answer desirably and be truthful. Matilda Jennings, in her chocolate calico, stood as relentlessly as any executioner before the Babcock sisters. They, slim and delicate and pale in their flabby black muslins, leaned toward each other, then Elizabeth straightened herself. “Some time when it's convenient I'd jest as soon show it as not,” said she. “Well, I'd be much obleeged to you if you would,” returned Matilda. Her manner was a trifle overawed, but there was a sharper gleam in her eyes. Pretty soon she went home, and ate her solitary and substantial supper of bread and butter, cold potatoes, and pork and beans. Matilda Jennings was as poor as the Babcocks. She had never, like them, known better days. She had never possessed any fine old muslins nor black silks in her life, but she had always eaten more. The Babcocks had always delicately and unobtrusively felt themselves above her. There had been in their lives a faint savor of gentility and aristocracy. Their father had been college-educated and a doctor. Matilda's antecedents had been humble, even in this humble community. She had come of wood-sawyers and garden-laborers. In their youth, when they had gone to school and played together, they had always realized their height above Matilda, and even old age and poverty and a certain friendliness could not do away with it. The Babcocks owned their house and a tiny sum in the bank, upon the interest of which they lived. Nobody knew how much it was, nobody would ever know while they lived. They might have had more if they would have sold or mortgaged their house, but they would have died first. They starved daintily and patiently on their little income. They mended their old muslins and Thibets, and wore one dress between them for best, taking turns in going out. It seemed inconsistent, but the sisters were very fond of society, and their reserve did not interfere with their pleasure in the simple village outings. They were more at ease abroad than at home, perhaps because there were not present so many doors which could be opened into their secrecy. But they had an arbitrary conviction that their claims to respect and consideration would be forever forfeited should they appear on state occasions in anything but black silk. To their notions of etiquette, black silk was as sacred a necessity as feathers at the English court. They could not go abroad and feel any self-respect in those flimsy muslins and rusty woollens, which were very flimsy and rusty. The old persons in the village could hardly remember when the Babcocks had a new dress. The dainty care with which they had made those tender old fabrics endure so long was wonderful. They held up their skirts primly when they walked; they kept their pointed elbows clear of chairs and tables. The black silk in particular was taken off the minute its wearer entered her own house. It was shaken softly, folded, and laid away in a linen sheet. Emily was dressed in it on the Fourth of July morning when Matilda Jennings called for her. Matilda came in her voluminous old alpaca, with her tin lunch-pail on her arm. She looked at Emily in the black silk, and her countenance changed. “My! you ain't goin' to wear that black silk trailin' round in the woods, are you?” said she. Matilda's poor old alpaca had many a threadbare streak and mended slit in its rusty folds, the elbows were patched, it was hardly respectable. But she gave the skirt a defiant switch, and jerked the patched elbows. “Well, I allers believed in goin' dressed suitable for the occasion,” said she, sturdily, and as if that was her especial picnic costume out of a large wardrobe. However, her bravado was not deeply seated, all day long she manœuvred to keep her patches and darns out of sight, she arranged the skirt nervously every time she changed her position, she held her elbows close to her sides, and she made many little flings at Emily's black silk. The two old women adjusted themselves stiffly upon their feet, and began ranging the grove, stepping warily over the slippery pine-needles. The woods were full of merry calls; the green distances fluttered with light draperies. Every little while came the sharp bang of a fire-cracker, the crash of cannon, or the melancholy hoot of a fish-horn. Now and then blue gunpowder smoke curled up with the golden steam from the dewy ground. Emily was near-sighted; she moved on with innocently peering eyes, her long neck craned forward. Matilda had been taking the lead, but she suddenly stepped aside. Emily walked on unsuspectingly, holding up her precious black silk. There was a quick puff of smoke, a leap of flame, a volley of vicious little reports, and poor Emily Babcock danced as a martyr at her fiery trial might have done; her gentle dignity completely deserted her. “Oh, oh, oh!” she shrieked. “I — couldn't,” gasped Emily; she could hardly speak. “Mebbe you can darn it, if you're real pertickler about it,” said Matilda, with an uneasy air. Emily said nothing; she went home. Her dress switched the dust off the wayside weeds, but she paid no attention to it; she walked so fast that Matilda could hardly keep up with her. When she reached her own gate she swung it swiftly to before Matilda's face, then she fled into the house. “No, you can't. Matilda would see it if you did. Oh, dear! oh, dear!” Emily dropped into a corner and put her slim hands over her face. After a little Emily looked up. “When did she die?” she asked, in a despairing voice. The next Sunday Elizabeth wore the black silk garnished with a crape flounce to church. Matilda Jennings walked home with her, and eyed the new trimming sharply. “Got a new flounce, ain't you?” said she, finally. “I had word last week that my aunt 'Liz'beth Taylor was dead, an' I thought it wa'n't anything more'n fittin' that I should put on a little crape,” replied Elizabeth, with dignity. Matilda said no more, but there was unquelled suspicion in her eye as they parted at the Babcock gate. The next week a trunk full of Aunt Elizabeth Taylor's clothes arrived from the West. Her daughter had sent them. There was in the trunk a goodly store of old woman's finery, two black silks among the other gowns. Aunt Elizabeth had been a dressy old lady, although she died in her eighties. It was a great surprise to the sisters. They had never dreamed of such a thing. They palpitated with awe and delight as they took out the treasures. Emily clutched Elizabeth, the thin hand closing around the thin arm. Elizabeth looked at Emily. A gleam came into her dim blue eyes; she tightened her thin lips. “Well, we will,” said she. The following Sunday the sisters wore the black silks to church. During the week they appeared together at a sewing meeting, then at church again. The wonder and curiosity were certainly not confined to Matilda Jennings. The eccentricity which the Babcock sisters displayed in not going into society together had long been a favorite topic in the town. There had been a great deal of speculation over it. Now that they had appeared together three consecutive times, there was much talk. On the Monday following the second Sunday Matilda Jennings went down to the Babcock house. Her cape-bonnet was on one-sided, but it was firmly tied. She opened the door softly, when her old muscles were straining forward to jerk the latch. She sat gently down in the proffered chair, and displayed quite openly a worn place over the knees in her calico gown. “We had a pleasant Sabbath yesterday, didn't we?” said she. “Real pleasant,” assented the sisters. “I heerd a good many say they thought it was a good discourse,” repeated Matilda, like an emphatic chorus. Then she suddenly leaned forward, and her face, in the depths of her awry bonnet, twisted into a benevolent smile. “I was real glad to see you out together,” she whispered, with meaning emphasis. Matilda paused for a moment; she drew herself back, as if to gather strength for a thrust; she stopped smiling. “I was glad to see you out together, for I thought it was too bad the way folks was talkin',” she said. Emily was softly weeping in her handkerchief; there was not a tear in Elizabeth's eyes; there were bright spots on her cheeks, and her slim height overhung Matilda Jennings imposingly. Now that the detective instinct and the craving inquisitiveness which were so strong in this old woman were satisfied, she should have been more jubilant than she was. She had suspected what nobody else in town had suspected; she had verified her suspicion, and discovered what the secrecy and pride of the sisters had concealed from the whole village, still she looked uneasy and subdued. “I sha'n't tell anybody,” said she. There was a moment's silence. “We sha'n't lay up anything,” said Elizabeth then, and Emily sobbed responsively. Matilda passed on, and opened the outer door. Elizabeth whispered to her sister, and Emily nodded, eagerly. “You tell her,” said she. Add A Gala Dress to your own personal library.